No traffic through the bore at Galitzin. 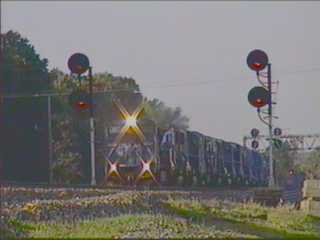 I was here back in 1994 and caught some good shots of Conrail using the single-track bore, while they lowered the tracks in the twin-bore. Cresson was a different story! This seemed even busier then Horseshoe Curve had been and it's set up with railfans in mind too. The city has a parking area beside the track with an elevated viewing platform. I met a few locals there as well as a fellow from LA with his 2 kids tagging along. From the viewing platform looking East toward the diamond and tower at Cresson. A Westbound light engine move which included a slug unit, second from the rear. This caboose is on display in Galitzen near tunnel hill, a model train museum is in a nearby building. A coal drag we paced for awhile on our way from Altoona to Sand Patch.